When Danny Allen of High Mountain Expeditions paddled down the Nolichucky River in Tennessee, he never expected to pick up this guest on his raft. However, the Knoxville News Sentinel reports that multiple river guides had previously noticed this little cub along the riverbanks and it was clear the animal was motherless, malnourished, and distressed. 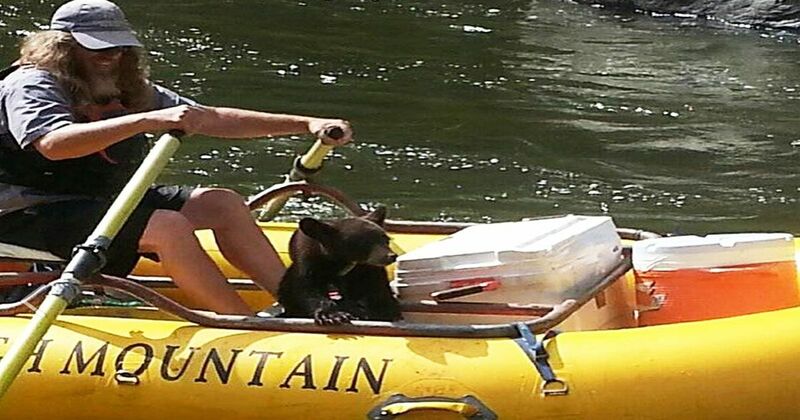 Therefore, Allen had no problem allowing the American black bear, later named "Noli Bear," onto his raft. Noli Bear was rehabilitated at the Appalachian Bear Rescue, who had plans to release her back into the wild after she'd gained sufficient weight and had demonstrated the proper skills to survive in her natural habitat. The Tennessee Wildlife Resources Agency tells the Knoxville News Sentinel that folks should avoid interfering with wild bears, instead calling organizations like themselves to deal with the animals. That being said, we tip our caps to the kind folks at High Mountain Expedition for saving Noli Bear's life! Dr. Ryan Sadler and Dr. Anri Benco of the University of Tennessee College of Veterinary Medicine get ready to examine Noli Bear. Not only that, Noli grew up to be the Appalachian Bear Rescue's most renowned celebrity: "She brought people from every corner of the world to our Facebook page to follow her journey back to the wild," they proudly recall. Noli in The Cub House. July 2015. The "severely dehydrated and lethargic" cub only weighed 14.5lbs when she was rescued - or "rescued herself," but rapidly started to grow stronger, making an amazing progress in just a few months. Noli Bear in a tree in the Wild Enclosure. August, 2015. Finally, on November 9, 2015, Noli was released weighing 78lbs. Noli Bear. November, 2015. Noli was released to back to the wild on November 9, 2015. In order to celebrate Noli's success on being released into the wild, an artist made a felted reproduction of Noli. The auctioned item made a whopping $531 on Ebay, and it all went to the "ABR's Return to the Wild Campaign."